March 15th was the three year anniversary of Dr. Nichole Martin taking over the practice after Dr. Bursell retired. Time sure does fly! All of us at Heavenly Smiles couldn’t be happier with the transition. Dr. Martin has been an amazing employer to us and has gotten only rave dental reviews from our Lynnwood patients. 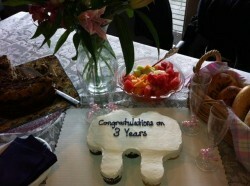 To celebrate her anniversary we are having lots of yummy treats today including the cupcake cake shaped like a tooth!